Sometimes last month, precisely on the 15th October I published the interview I had with the intellectual and passionate young man Chukwuma Ogboi, in case you missed it click here. During the interview he discussed with us that he is about to release a book and it is my duty to keep you guys updated. Im sorry Im just telling you, the book was released last week on the 23rd of November; you havent missed much as the book is trending presently. What is a book without reviews? Its not about writing a book, the real magic is in making your audience satisfied. I was able to get some reviews about the book. 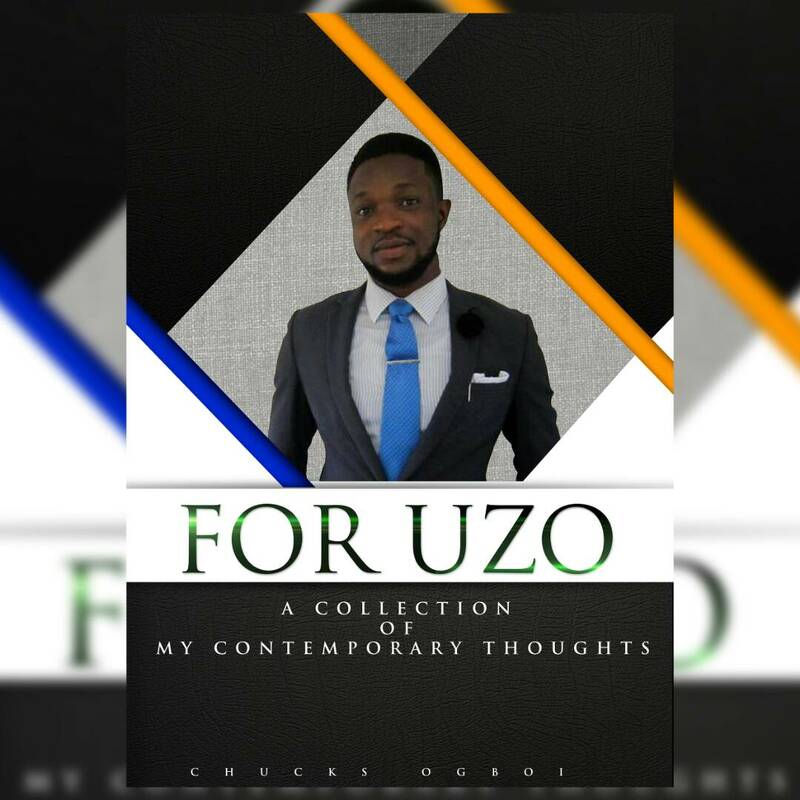 Here is what some individuals had to say about the book titled For Uzo: A collection of My Contemporary thoughts written and compiled by Ogboi Chukwuma. The book is an e-book that contains 14 chapters which each chapter discussing extensively the issues faced by our dear nation and it also contains the steps we can take to move forward as a nation. 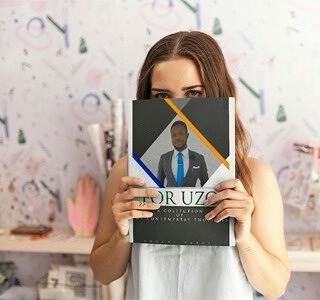 The book, “For Uzo” (A Collection of My Contemporary Thoughts) by Ogboi Chukwuma does not only propel you to create a reading habit, it equally opens your mind to seemingly unhidden happenings at least in the last one decade and as far as good governance and history are concerned in Nigeria. The thoughts expressed in the book are as real as the air we breathe every second, this makes the book a practical specimen and true identity of Nigeria under her different levels of hierarchical leadership. Ogboi’s choice of words is highly commendable. He aesthetically selected his words and used a tone that’s powerful enough to drive home salient points. These points are a nip in the bud which will in the long run set a pace and historically define the face of leadership in Nigeria and create an extension to other African countries. Lending a voice to address a matter of good governance in a volatile society like Nigeria makes Ogboi a hero and I commend him highly for that. Having read the book, and known its importance, I highly recommend it to everyone who sees good governance as a prerequisite to improved standard of life. Pick a copy of the book and read. You would have great time reading it. The way leadership is demonstrated in this country is compelling enough to believe that the asylum has been taken over by lunatics or how else does one explain a nation where public office holders are either not accountable for activities under their supervision or often times not responsible for their actions and inactions. If a senior executive of a company walks into an outlet to order for his brand and he is told by the attendant that his brand is out of stock but he should jolly well make do with a competitor’s brand. What do you think would happen next? The executive will put a call through to the area manager of the company, who will very likely put another call through to the sales executive covering that district to demand an explanation for why their brand is out of stock in a local outlet where a competitor’s brand is available. This is a compelling read! A very stimulating discourse that would require deliberate actions to create a new haven for all. Despite the fact that I’m a voracious reader, I rarely read a book from UPCOMING Nigerian writers because I’ve a kinda high standard for my source of information. Myles Munroe in his book titled ‘The Spirit of Leadership’ emphasized the importance of ones source of information because it determines ALL/EVERYTHING one is gonna be. Despite this my HIGH standard for my source, there are few NON-CELEBRITY NIGERIANS that I can leave my 6 units course’ handout which I’m supposed to write the exams the following day just to read their Facebook posts. One of these RARE NIGERIAN YOUNGSTERS is Mr. Chukwuma Innocent Ogboi because his views are always what is needed i.e. right rather than what he wants or what agrees with his previous stand. I’ve read his post & wonder how somebody can find it easy to praise the good work of one person & in less than 24hrs constructively criticize the wrong done by the same BIG NAME/TOP GUN. Guess why I’m saying all these! You ain’t good at guessing? Alright then. This man has decided to be a blessing to this generation and the ones yet unborn by putting/compiling together some of these aforementioned iconic thoughts in a book. BOOK? Yes, you read me right. 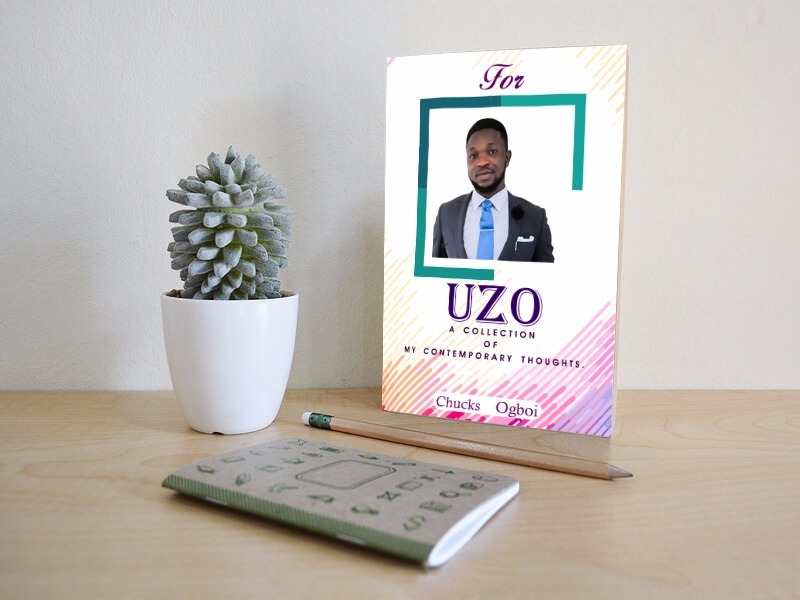 And in order not to keep YOU in darkness by not informing you of what is coming into town beforehand, I officially present to YOU: For Uzo and A collection of my contemporary thoughts by Chuks Ogboi. I and my team at DAM foundations fully endorse this because we know it is going to be one of those books that will discuss key issues needed by YOU as individual and US as a nation. I without asking Mr. Writer’s permission personally approve your constructive criticisms because I know him as a dynamic professional ever open to ways to improve. Save towards the purchase of this masterpiece and help spread the good news as we count on YOU to be a part of this success story. In recent time, there has been different views expressed by different Nigerians on the state of the Nation. The book is already available and I bet you dont want to miss it. So do yourself a favour and get a copy. This is one book I read and got me glued, one interesting factor is that the author laid down the problems but he didnt stop there, he went ahead to proffer solutions! A better Nigeria is possible and that is why I will encourage every passionate Nigerian both young and old to please get this book, read it and act for the change begins with us as individuals. After reading those reviews, I’m pretty sure the next thing on your mind is how do I get a copy? relax, I’ve got you covered. If you want to get a copy click here and make your order. Im not giving you lies; I personally endorse this book even for the next generation. If we desire a better nation then the time to act is now. Next Post HOW MUCH DO YOU LOVE HIM?